It has been widely reported in the press this week that the reburial of Nicolas Copernicus in a rather grand tomb represents the Catholic Church "repenting" for branding him a heretic (The London Times) or it "making peace" with him (GMA News). To be fair, GMA go on to note that the reason Copernicus was originally buried in an umarked tomb was because he was a bit of a nobdy at the time he died. And the fact that he was buried in Fromberg Cathedral at all shows he was a respected member of the community in full communiun with the Church. Still, he's now very famous and gets a flashier resting place. Part of this is Polish nationalism. Copernicus is the second-best-known Pole in history (after John Paul II) and suggestions that he was actually German have not pleased patriots (see some very upset people on the Wikipedia discussion page). So the reburial is an assertion that he was Polish as much as being a respected servant of the Catholic Church. But none of that fits the science versus religion agenda of the media. One contemporary response is that possibly "there has been an evolution of worlds (in the sense of whole universes) and the world we find ourselves in is simply one among countless others that have existed throughout all eternity." And given infinitely many universes, Daniel Dennett thinks, all the possible distributions of values over the cosmological constants would have been tried out (p. 179); as it happens, we find ourselves, naturally enough, in one of those universes where the constants are such as to allow the development of intelligent life. But then the probability of theism, given the whole array of worlds, isn't particularly high. In the same way, then, a theist might agree that it is unlikely, given just what we know about our world, that there is such a person as God. But perhaps God has created countless worlds, in fact, all the worlds (all the universes) in which there is a substantial overall balance of good over evil. In some of these worlds there is no suffering and evil; in some a good deal; as it happens, we find ourselves in one of the worlds where there is a good deal. But the probability of theism, given the whole ensemble of worlds, isn't particularly low. I suppose one could argue that it's ad hoc to propose a multiverse in order to deal with the problem of evil, but I don't see how it's any less ad hoc than proposing it to account for the anthropic coincidences. The raison d'etre of a career in academia is to savage your opponents in print under the pretext of a book review, and thereby destroy their life's work within a few carefully worded paragraphs. Hence the spats that occur amongst the intelligencia are among the most entertaining reading. From where, then, do modern liberal values derive? Why, from ancient Greece, of course. 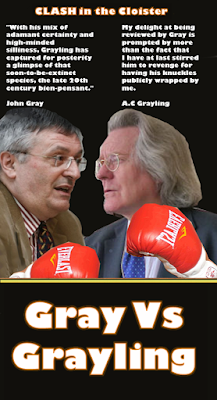 Retelling an old rationalist fairy tale, Grayling writes in the entry on justice, “the ancient Greeks were, as with so many things, the first to rate the possession of a sense of justice, and moreover one on which one acts, as a virtue.” Well, so much for the Hebrew prophets. Again, in the entry on Buddhism he asserts that “the Greeks assumed that we are individuals, and as such are ethical agents responsible for ourselves and what we do,” and created a “new ethics of civic, intellectual and moral virtue.” On the contrary, what is most striking about the ancient Greeks is that they had hardly any sense of the human individual as being independent of society, and having rights against it. After all, Socrates never contested the right of the Greek polis to put him to death. Reading Grayling, it is hard to resist the impression that he believes Western civilization would be much improved if it did not include the Judeo-Christian inheritance. Absurd as it is, there is nothing new in such a claim. It is one of the most venerable clichés of Enlightenment thinking, and Ideas that Matter is a compendium of such dated prejudices. I am delighted to have been reviewed at such length in The National Interest by John Gray, whom I was beginning to suspect of too impervious a dignity ever to respond to the repeated bashings I have had to give his views over the last several years. Reading this, I am compelled to conclude there is only one way to decide the question of the relative success or failure of the enlightenment project and the contested source of western values and that's IN THE RING. Tickets go on sale next week.